Une cabane en rondins construite sur mesure et très privée nichée dans un cadre pittoresque surplombant un magnifique étang alimenté par une source et offrant une vue pittoresque sur les Blue Mountains. The cabin is just as beautiful as the pictures shown. The wood fireplace is amazing! This was a truly the perfect cabin experience. Exactly what we were looking for. Gorgeous view and quiet and secluded. I already can’t wait to book this again. Such a wonderful little place. Exceeded our expectations by a mile. My husband and I enjoyed a very relaxing stay in this beautiful cottage with gorgeous views! Hope to be back! A must for anyone wanting a romantic time away from everyone and everything. Absolutely beautiful. We will definitely be back!!! Thank you John and Cheryl for everything. It was perfect. 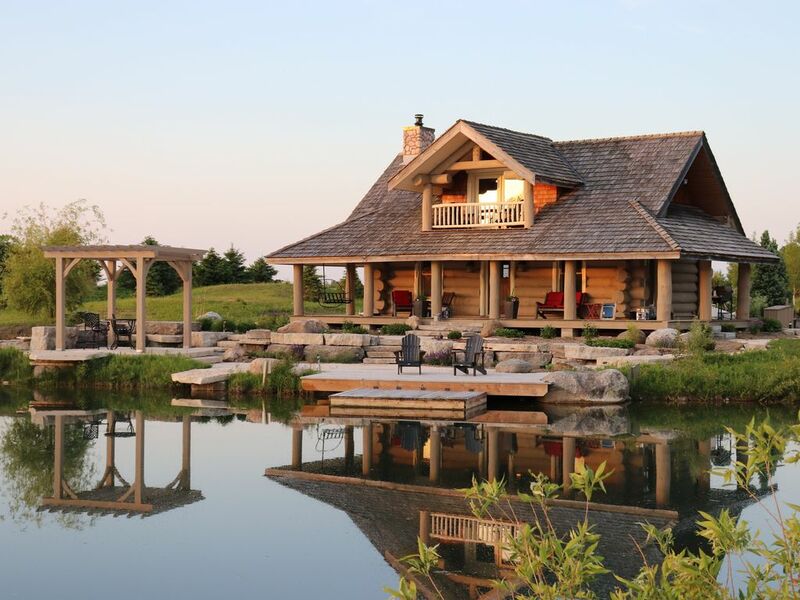 John and Cheryl have a beautiful and comfortable log cabin for two that sits right in front of a private pond in Collinwood Canada. My husband and I went in December and it was beautiful with the snow all around us and the pond somewhat frozen. We lite a fire in the fireplace and relax all weekend as well as visited the great town of Collinwood. We also visited the Scandinavian Spa about 15 minutes away which had outdoor hot baths. It was wonderful to have our private log cabin to come back to for peace and quite and quality time with my husband. Thank you John and Cheryl for sharing your slice of havean with us.